Country Pets & Ponds now carries several varieties of the dwarf neocaridina shrimp including red cherry shrimp, 24 ct yellow shrimp, & blue velvet shrimp, as well as whisker shrimp, and dwarf orange Mexican freshwater lobsters. Neocaridina shrimp are easy to keep and they look great in a planted shrimp only nano tank, or with small schooling fish such as neon tetras. Whisker shrimp are clear in color and they can get 2-2.5 inches in length. We don’t recommend keeping whisker shrimp with the neocaridina shrimp as they are quite a bit larger. 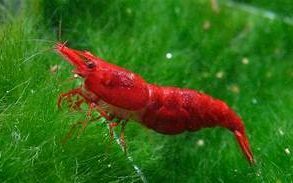 This is the red version of the neocaridina shrimp, often known as cherry shrimp or fire shrimp. 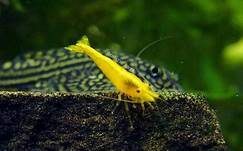 This is one of the yellow versions of the neocaridina shrimp. Another variety known as the 24ct. yellow shrimp has a brighter yellow stripe down its back. This if the dwarf orange Mexican lobster. It can normally be housed with the dwarf shrimp.